Note: I meant to post this a couple weeks ago, but was sidetracked. Though not the most timely post, I still wanted to comment on the situation. The Holy Thorn before being vandalized in 2010. 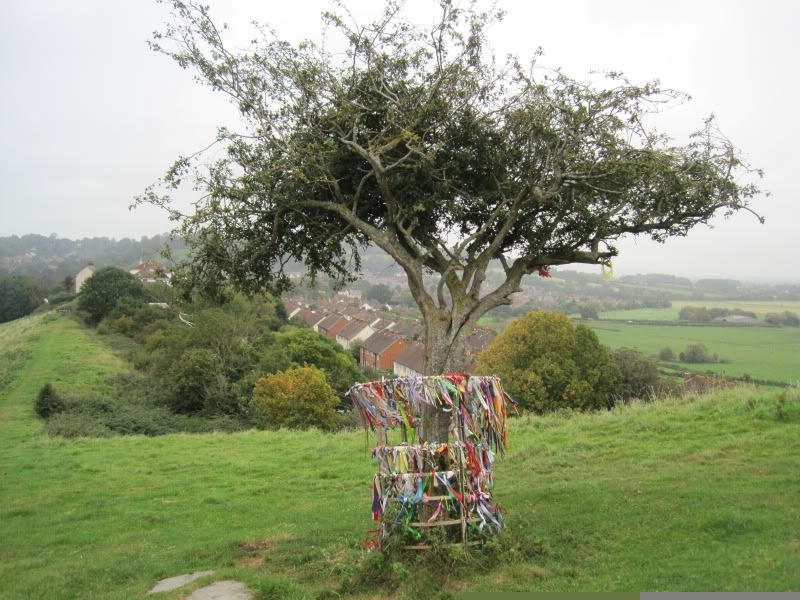 On Palm Sunday (April 1), the good folks of Glastonbury tried to move forward from a terrible event – they planted a new Holy Thorn tree on top of Wearyall Hill. You might remember the story seen here last September about the vandalizing of the thorn tree in December 2010 and the subsequent efforts to save it. However, the misdirected affection for the tree by people pouring honey and beer on it and removing leaves from it (presumably as souvenirs) has prevented it from making a recovery (take it from this gardener – the best uses for beer in the garden are to kill slugs and to speed up composting – not to help a tree recover from damage). According to the This is Somerset web site, a new shoot taken from a Devon nursery’s parent tree that was originally taken from Glastonbury was used to replace it. Much to the shock and dismay of many, vandals have destroyed the new thorn tree as well. Though there are already plans to replace it and try to make it more secure, this is devastating news. Further, it is a pathetic act committed by selfish individuals. In case you are unfamiliar with the story of the Glastonbury Holy Thorn, there is a body of mythology about Joseph of Arimathea coming to England after the death of Jesus, wearily climbing the hill where they landed (now Glastonbury’s Wearyall Hill), and planting his staff – which took root and became the thorn tree. As a law-abiding citizen, I deplore the illegal destruction of property. As a tree hugger, I deplore the destruction of one of Gaia’s trees. But the main reason is that the Christian and Pagan elements at Glastonbury are interwoven. Joseph is credited not only with causing a thorn tree to grow but also with bringing the Holy Grail to the Isle. Further, the legends of the Grail family say they are descended from him. Yet there are Pagan associations with the Grail, particularly the idea of the Celtic Cauldron of Rebirth being the mythological predecessor of the Grail. And there are other Pagan colorings to the Grail stories. The truth is, these two seemingly disparate religions share much when it comes to Glastonbury and its legends. 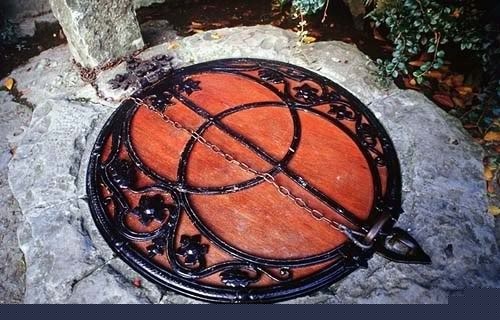 And both Pagans and Christians travel to this place as a spiritual quest – walking together up the Tor and visiting the Chalice Well and Gardens. Much like the vesica piscis design that adorns the Chalice Well’s cover, these two religions are two entities that overlap. They cannot be completely separated – at least not at Glastonbury. The Chalice Well cover featuring a vesica piscis design. So I hope some of you join me in sending energy to heal the Holy Thorn as well as the hearts of those who feel the need to destroy something beautiful to so many people. Since the last post discussing shoes in folk magic, there’s been another incidence of old shoes found used for such a purpose – this time in Australia. But I’m really in the mood to go in depth on another favorite plant – you might remember the post on rosemary last fall. A few weeks ago, spring officially started and kicked off the annual event that is one of the prettiest sites in my humble yard: the forsythia arching golden branches over the rich green and violet blooms of the periwinkle ground cover that lies beneath the bushes. 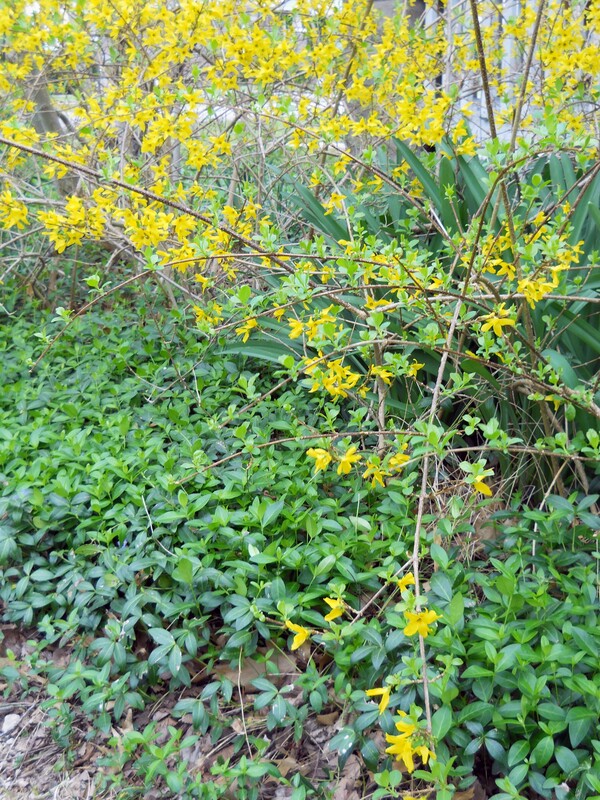 Branches of forsythia flowers flow onto a growth of Vinca minor, also known as Periwinkle. To be clear, the variety of periwinkle I have and am most familiar with has the Latin name of Vinca minor, or Lesser Periwinkle. Other varieties include Vinca major (Greater Periwinkle) and Vinca rosea (Madagascar Periwinkle). This lush green plant is found in Europe, Asia, and North America. If the number of nicknames a plant has is indicative of its popularity, I’m not the only one who likes it. Periwinkle has also been called Ground Ivy, Pennywinkle, Blue Buttons, Joy on the Ground, Devil’s Eye, Pucellage (French for Virginflower), and more. In folk medicine, it was used as an astringent, to stop bleeding, to clear mucus, to stop muscle cramps, and more. In today’s medicine, the alkaloids in Madagascar Vinca are used to treat diabetes and high blood pressure. Medicinally, this variety is best known as a cancer fighter. Caution: Some Vinca can be slightly poisonous, so don’t ingest it as a folk remedy without serious research and do not let pets chew on it. Another folk name is Sorcerer’s Violet, and clearly connects to the plant’s use in folk magic for charms and to get rid of evil spirits. The folk magic uses of the plant are contingent upon it being gathered under very specific conditions including cleanliness, specific lunar times, and with an incantation. These being met, the plant could be used to attract money and for protection against everything from wild beasts to the evil eye. Some place it over their doors to protect the home. 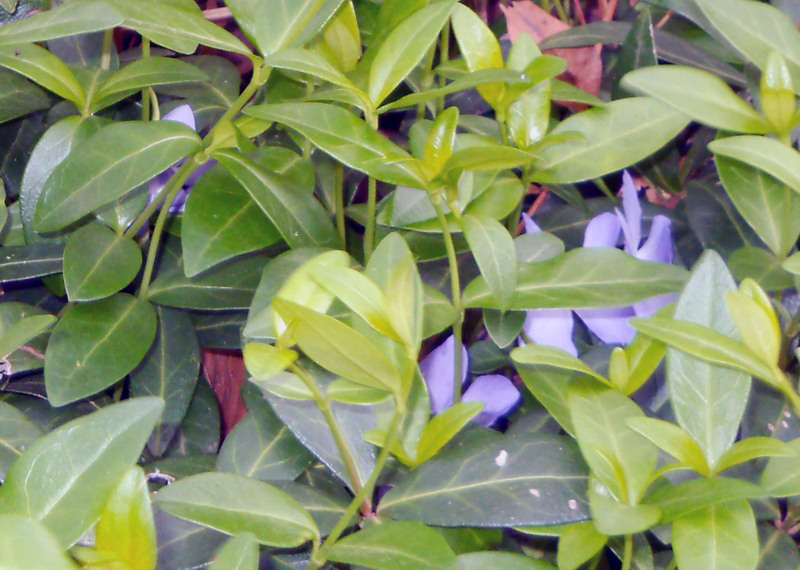 Some Periwinkle blooms hide under the evergreen foliage. It can also be used in love spells as well. According to hoodoo expert Catherine Yronwode, the five-petaled flowers symbolize spiritual peace and harmony. In the Encyclopedia of 5,000 Spells, the Bouquet Spell – Sorcerer’s Violet says that adding Vinca will turn “any bouquet into an instrument of seduction.” It then says to sprinkle a bouquet of romantic flowers with dried Vinca flowers and then give them to the woman of your desire. Whether this lovely plant brings me some amore or not, I still love it!